It is time to re-open the files. 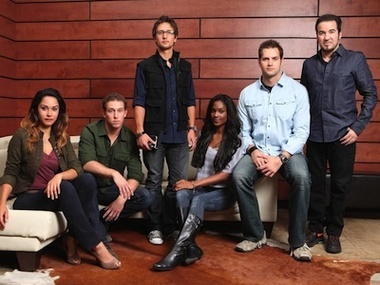 After debuting on Syfy in July 2010, Fact or Faked: Paranormal Files became a hit by investigating captured video evidence of strange and unusual phenomena. Led by former FBI agent Ben Hansen, the team of scientist Bill Murphy, journalist Jael de Pardo, tech specialist Devin Marble, stunt expert Austin Porter and newest team member, photographer Lanisha Cole, divide their skills to recreate, debunk or validate the videos. Now in its second season, the show has average 1.5 million viewers (up 57% from its first season) and will be returning tonight at 9 p.m., Oct. 19, for six more episodes. What has separated Fact or Faked from other shows thus far is that it examines all aspects of the paranormal, including ghosts, aliens, monsters and witches. To kick off the new season, the team will be conducting experiments at bigger and more historical locations - and promise to literally use explosive methods. In tonight's episode (“UFO Crash Landing / Graveyard Ghost”), the team will be investigating a reported UFO crash landing as well as a ghostly image that captured in a Nevada cemetery. We recently checked in with Hansen and de Pardo about the new season, how the show and paranormal field has changed since they began, what they're thoughts are on celeb investigators and Ghost Hunters Live - and we even catch a glimpse of Hansen losing his train of thought. PPC: How do you think the paranormal field and quality of evidence has changed since the show initially premiered? Jael de Pardo: Well for one I feel that a lot of the cases that we've been tapping into are perhaps bigger and more historical. They've been talked about for a really long time. And then it's exciting to be able to go into the field and document our own evidence in regard to these anomalies that people have been talking about for a very long time. And you know, I haven't particularly been on a few of the ghost cases that our team has been on, but they have returned with some very, very incredible evidence. For example with EVP sessions that indicate some kind of connection to the story behind the place that we're investigating. It's been pretty phenomenal actually. Ben Hansen: Yes I agree. I also would add too that the way that we gather evidence is pretty much standard; we do things a certain way. But we've been able to come up with some really great - you know what, I totally lost my train of thought. I was going off of something that Jael was talking about. It will come to me in just a minute. And then I'll answer your question. JDP: We were talking about gathering evidence and EVPs. JDP: It's totally okay. You know I'll pick up on that. The other exciting thing about some of these large scale cases is our experiments are also becoming more large scale. Our technology has become more advanced and we've done some things that are literally explosive. And really exciting to be a part of even though you have to stand pretty far at a distance for safety purposes, but it's really fun stuff to watch. BH: ... but maybe not that incident was paranormal but the place itself is. JDP: That's a good point Ben. It's interesting that we have been able to replicate some of these videos, but then it's allowed us to peel down these layers that have actually added complexity to the case and made us even more perplexed about it and whether or not it could be real or not. PPC: What type phenomena do you guys find people are most interested in? BH: It kind of runs the whole gamut of everything. You've got the core followers it seems of Ghost Hunters, who seem to love the ghost cases. However we're really one of the only shows currently on TV still looking into the UFO phenomena. And so I think when they break it down and see what people love the most, they love a little bit of everything. PPC: Do you guys think you would ever have a celebrity guest investigator on the show and who you would want? BH: The idea has been kicked around definitely. I know we've got a long list of people from the other Syfy shows that really want to do a crossover with us. And there are a few celebrities that I've been told believe their house is haunted or just really love this type of thing. In particular, there's no one, no celebrity outside of Syfy that I've talked to personally yet because those kinds of decisions also involve the network and the arrangements they can make with them to do that. PPC: Do you think you will be going on the Ghost Hunters live Halloween show at Pennhurst? BH: We were just talking about this, actually. BH: We weren't sure this subject was going to come up but we have been invited, both Jael and myself. So we're looking forward to it. It will be a lot of fun.